"Sarpy County is home of Bellevue, Gretna, La Vista, Papillion, Springfield, and Offutt Air Force Base. 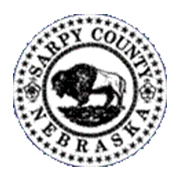 Sarpy County has a population of over 125,000 and is located in the eastern part of the state, just south of the City of Omaha, Nebraska." - from: http://www.sarpy.com/. 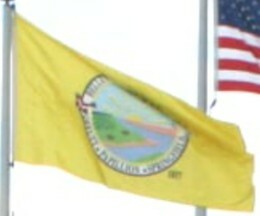 Regarding its Sesquicentennial, the County held a flag contest. You may see the entries here: www.sarpy.com/150/SarpyFlags/Album1.htm. However, there is no word about the contest, if it finished and if the County chose one of designs for its flag. The County's Sesquicentennial webpage said a winner would be announced Feb 8th. A cached page from the Omaha World-Herald Feb. 5 edition says, referring to the ceremonies scheduled for Wed. the 8th: "The county's first official flag, designed by Platteview High School student John Sliffe, will be unveiled and raised above the courthouse at 10 a.m...." The new Sarpy County flag is..... a seal on a white flag.